What happens to your data should you die? How can you protect your digital data privacy and your online foot print? It’s been stated that as much as 50% of ALL consumers have had their data compromised online in one way or another. Be Educated! 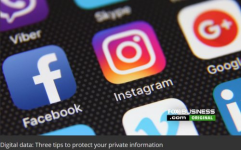 Did you know that uploading a photo to your social media or sharing your location when downloading an app, it contributes to your digital footprint. Time for Spring Cleaning! Most American have over 150 online ACTIVE accounts! (Wow!) Now is the time to go into your social media accounts and delete those apps that you don’t use anymore. Understand WHAT contributes to your digital footprint. People need to know when they are sharing photos on social media, it’s not a good time to say, “Hey, I’m going to be away on vacation.” You can share those photos and where you went AFTER you return, if you choose. If you have questions regarding your digital data and how you can further protect yourself from breaches, give Mardo a call at (661) 588-8862. * This article was derived directly from video . foxnews . com No copyright infringement intended.